H&E (haematoxylin and eosin) stained lung tissue sample from an end-stage emphysema patient. RBCs are red, nuclei are blue-purple, other cellular and extracellular material is pink, and air spaces are white. Emphysema is a progressive, chronic obstructive lung condition where there is a permanent enlargement or overdistention of the alveoli (air sacs) and an irreversible destruction of the alveolar walls, causing a restriction in oxygen uptake and shortness of breath. It is often caused by exposure to toxic chemicals or long-term exposure to tobacco smoke, although a small number of cases are traced to a genetic defect. Emphysema was traditionally a lung disease suffered by miners, especially coal miners, and has been referred to as miner's lung or black lung (Skinner 2005). Emphysema presently is incurable. It is the fourth leading cause of death in the United States, after heart disease, cancer and stroke, and is the most common death from respiratory disease (Swartout-Corbeil 2006). With the exception of the small number of cases caused by a hereditary condition, emphysema is considered to be preventable. In some cases, the responsibility is a social one, such as employing workers for long hours underground in coal mines, without protection, or cases of airborne environmental contaminants. In other cases, the responsibility is a purely personal one, such as taking up smoking and forgoing long-term health for more immediate pleasure. Proper lung function involves an elastic aspect of the lungs, whereby expansion and contraction of the lungs moves air in through the bronchial passages and down into the increasingly fine network of tubing in the lungs called the alveoli. Alveoli (singula alveolus) are anatomical structures that have the form of a hollow cavity. Mainly found in the lung, the pulmonary alveoli are spherical outcroppings of the respiratory bronchioles and are the primary sites of gas exchange with the blood. Oxygen in the lungs first diffuses through the alveolar wall and dissolves in the fluid phase of blood, while carbon dioxide moves from the blood into the lungs. 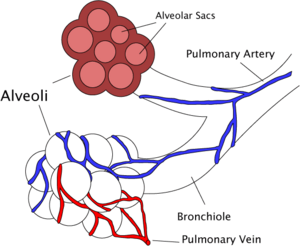 Alveoli are particular to mammalian lungs. The human lungs contain about 300 million alveoli, representing a total surface area of 70-90 square meters, each wrapped in a fine mesh of capillaries. Emphysema essentially is caused by loss of elasticity (decreased compliance) of the lung tissue, from destruction of structures supporting the alveoli, and destruction of capillaries feeding the alveoli. The result is that the small airways (bronchioles) leading to the alveoli collapse during exhalation (although alveolar collapsibility has increased), leading to an obstructive form of lung disease. In obstructive lung diseases, airflow is impeded and air is generally "trapped" in the lungs. Unable to move the air out, the alveoli over-expand and can rupture (Swartout-Corbeil 2005). Symptoms include shortness of breath on exertion (typically when climbing stairs or inclines, and later at rest), hyperventilation, and an expanded chest. To be emphysema, not only is there enlargement or overdistention of the alveoli, but also destruction of the alveoli; that is, irreversible loss of this tissue. Snider et al. 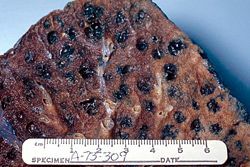 (1985) define emphysema as "a condition of the lung characterized by abnormal, permanent enlargement of airspaces distal to the terminal bronchioles, accompanied by the destruction of their walls, and with obvious fibrosis." Emphysema is commonly associated with bronchitis and chronic bronchitis. Since it is difficult to delineate "pure" cases of emphysema or chronic bronchitis, they are generally grouped together as chronic obstructive pulmonary disease (COPD). In the case of inhaling tobacco smoke or other respiratory irritants, the following is the scenario considered to lead to emphysema. In response to the toxins, the immune system reacts to defend the lungs and there is a localized inflammatory response. Chemicals released during the inflammatory response (e.g., proteases such as elastase) can break down the walls of alveoli (alveolar septum). This leads to fewer but larger alveoli, with a decreased surface area and a decreased ability to absorb oxygen and exude carbon dioxide by diffusion. Normally, the activity of another molecule called alpha 1-antitrypsin (A1AT) neutralizes the destructive action of the damaging proteases that destroy the structural proteins (elastin and collagen). However, in smokers there is chronic inflammation and this prevention does not occur leading to the damage of lung tissue and loss of elasticity. Another cause, which is very rare, is the hereditary disorder known as alpha 1-antitrypsin deficiency (AAT). In this case, the level of the protease inhibitor is not sufficient to counteract the destructive proteases (Stauffer 2002). In AAT, inflammatory enzymes such as elastase are able to destroy the alveolar tissue (the elastin fiber, for example). Most AAT patients do not develop clinically significant emphysema, but smoking and severely decreased A1AT levels (ten to 15 percent) can cause emphysema at a young age. In all, AAT causes about two percent of all emphysema. However, smokers with AAT are in the highest risk category for emphysema. Severe cases of AAT may also develop cirrhosis of the liver, where the accumulated A1AT leads to a fibrotic reaction. Emphysema patients are sometimes referred to as "pink puffers." This is because emphysema sufferers may hyperventilate to maintain adequate blood oxygen levels. Hyperventilation explains why mild emphysema patients do not appear cyanotic as chronic bronchitis (another COPD disorder) sufferers often do; hence they are "pink puffers" (able to maintain almost normal blood gases through hyperventilation and not "blue bloaters" (cyanosis; inadequate oxygen in the blood). However, any severely chronically obstructed (COPD) respiratory disease will result in hypoxia (decreased blood partial pressure of oxygen) and hyperapnia (increased blood partial pressure of carbon dioxide), called Blue Bloaters. Blue Bloaters are so named as they have almost normal ventilatory drive (due to decreased sensitivity to carbon dioxide secondary to chronic hypercapnia), are plethoric (red face/cheeks due to a polycythemia secondary to chronic hypoxia) and cyanotic (due to decreased hemoglobin saturation). After a prolonged period, hyperventilation becomes inadequate to maintain high enough oxygen levels in the blood. The body compensates by vasoconstricting appropriate vessels. This leads to pulmonary hypertension, which places increased strain on the right side of the heart, the one that pumps deoxygenated blood to the lungs, fails. The failure causes the heart muscle to thicken to pump more blood. Eventually, as the heart continues to fail, it becomes larger and blood backs up in the liver. Clinical signs at the fingers include blueness of the fingernails and cigarette stains (although actually tar) and asterixis (metabolic flap) at the wrist if they are carbon dioxide retainers. (Note: Finger clubbing is NOT a general feature of emphysema). Examination of the face reveals a plethoric complexion (if there is a secondary polycythemia), blueness of the lips, pursed-lipped breathing, and central cyanosis. Examination of the chest reveals increased percussion notes (particularly over the liver) and a difficult to palpate apex beat (all due to hyperinflation), decreased breath sounds, audible expiratory wheeze, as well as signs of fluid overload (seen in advanced disease) such as pitting peripheral edema. Overall, there is breathlessness and exhaustion. Coughing and wheezing can be common symptoms, as well as chronic mucus production (Skinner 2005). Classically,clinical examination of an emphysematic patient reveals no overt crackles; however, in some patients the fine opening of airway "popping" (dissimilar to the fine crackles of pulmonary fibrosis or coarse crackles of mucinous or oedematous fluid) can be auscultated. Diagnosis is by spirometry (lung function testing), including diffusion testing. Findings will often demonstrate a decrease in FEV1 but an increase in Total Lung Capacity (TLC). Diffusion tests such as DLCO will show a decreased diffusion capacity. Other investigations might include X-rays, high resolution spiral chest CT-scan, bronchoscopy (when other lung disease is suspected, including malignancy), blood tests, and pulse. Emphysema is an irreversible degenerative condition. The most important measure that can be taken to slow the progression of emphysema is for the patient to stop smoking and avoid all exposure to cigarette smoke and lung irritants. Pulmonary rehabilitation can be very helpful to optimize the patient's quality of life and teach the patient how to actively manage his or her care. Improved breathing techniques can make a difference, and avoidance of chlorinated pools and various processed foods with pesticides and chemicals (Skinner 2005). Immunization against influeza virus and Streptococcus pneumoniae infection is another treatment (Stauffer 2002). Emphysema is also treated by supporting breathing with anticholinergics, bronchodilators, and (inhaled or oral) steroid medication, and supplemental oxygen as required. Treating the patient's other conditions, including gastric reflux and allergies, may also improve lung function. Supplemental oxygen used as prescribed (20+ hours/day) is the only non-surgical treatment that has been shown to prolong life in emphysema patients. Other medications are being researched. There are lightweight portable oxygen systems that allow patients increased mobility. Patients fly, cruise, and work while using supplemental oxygen. Lung volume reduction surgery (LVRS) can improve the quality of life for certain carefully selected patients. It can be done by several different methods, some of which are minimally invasive. In July of 2006, a new treatment, placing tiny valves in passages leading to diseased lung areas, was announced to have good results—but seven percent of patients suffered from partial lung collapse. The only known "cure" for emphysema is a lung transplant, although few patients are strong enough physically to survive the surgery. The combination of a patient's age, oxygen deprivation, and the side-effects of the medications used to treat emphysema cause damage to the kidneys, heart, and other organs. Transplants also require the patient to take an anti-rejection drug regime, which suppresses the immune system and creates other medical problems. A study published by the European Respiratory Journal suggests that tretinoin (commercially available as Accutane, an anti-acne drug) derived from vitamin A can reverse the effects of emphysema in mice by returning elasticity (and regenerating lung tissue through gene mediation) to the alveoli (Mao et al. 2002; BBC 2003). While vitamin A consumption is not known to be an effective treatment or prevention for the disease, some consider that research into this area could lead towards a cure. A newer follow-up study reported on in 2006 found inconclusive results ("no definitive clinical benefits") using Vitamin A (retinoic acid) in treatment of emphysema in humans and stated that further research is needed to reach conclusions on this treatment (Roth et al. 2006). While AAT provides some insight into the pathogenesis of the disease, hereditary A1AT deficiency only accounts for a small proportion of the disease. Studies for the better part of the past century have focused mainly upon the putative role of leukocyte elastase (also neutrophil elastase), a serine protease found in neutrophils, as a primary contributor to the connective tissue damage seen in the disease. This hypothesis, a result of the observation that neutrophil elastaseis is the primary substrate for A1AT, and A1AT is the primary inhibitor of neutrophil elastase, together have been known as the "protease-antiprotease" theory, implicating neutrophils as an important mediator of the disease. However, more recent studies have brought into light the possibility that one of the many other numerous proteases, especially matrix metalloproteases, might be equally or more relevant than neutrophil elastase in the development of non-hereditary emphysema. The better part of the past few decades of research into the pathogenesis of emphysema involved animal experiments where various proteases were instilled into the trachea of various species of animals. These animals developed connective tissue damage, which was taken as support for the protease-antiprotease theory. However, just because these substances can destroy connective tissue in the lung does not establish causality. More recent experiments have focused on more technologically advanced approaches, such as ones involving genetic manipulation. Perhaps the most interesting development with respect to our understanding of the disease involves the production of protease "knock-out" animals, which are genetically deficient in one or more proteases, and the assessment of whether they would be less susceptible to the development of the disease. British Broadcasting Corporation. 2003. Vitamin may cure smoking disease BBC News December 22, 2003. Retrieved February 4, 2008. Mao, J. T, J. G. Goldin, J. Dermand, G. Ibrahim, M. Brown, A. Emerick, M. McNitt-Gray, D. Gjertson, F. Estrada, D. Tashkin, and M. Roth. 2002. A pilot study of all-trans-retinoic acid for the treatment of human emphysema Am J Respir Crit Care Med 165(5): 718-723. PMID 11874821 Retrieved February 4, 2008. Roth, M., J. Connett, J. D'Armiento, R. Foronjy, P. Friedman, J. Goldin, T. Louis, J. Mao, J. Muindi, G. O'Connor, J. Ramsdell, A. Ries, S. Scharf, N. Schluger, F. Sciurba, M. Skeans, R. Walter, C. Wendt, and R. Wise. 2006. Feasibility of retinoids for the treatment of emphysema study Chest 130(5): 1334-1345. PMID 17099008 Retrieved February 4, 2008. Skinner, P. 2005. In J. L. Longe, The Gale Encyclopedia of Alternative Medicine. Farmington Hills, Mich: Thomson/Gale. Snider, G. L., J. Kleinerman, W. M. Thurlbeck, and Z. H. Bengali. 1985. The definition of emphysema. American Review of Respiratory Diseases 132: 182-185. Stauffer, J. L. 2002. In L. Breslow, Encyclopedia of Public Health. New York: Macmillan Reference USA/Gale Group Thomson Learning. This page was last modified on 2 April 2008, at 06:27.